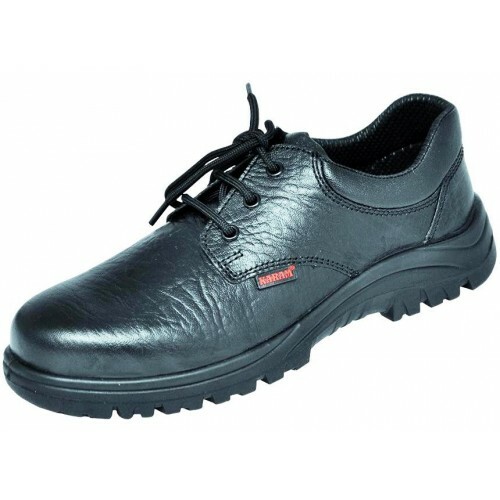 Karam GRIPP FS 05 Safety Shoe Worker’s Safety Shoe providing safety with comfort. Upper : Made from Full Grain leather. Quarter Lining : Black Cambrel lining. Vamp Lining : Highly abrasion resistant fabric lining. Sole: Single density PU sole. Cleated Outsole with wider cleats for higher grip and self cleaning effect. Antistatic, Oil/Acid Resistant, Anti Slip and Heat Resistant with shock absorbing property, Anti Fatigue.